Summary: The new Blue Water Convention Center was dedicated on April 17 in Port Huron, Michigan. St. Clair County retained Convergence Design as a design consultant for the project to provide guidance to the design team on convention center planning and design issues. That was St. Clair County Administrator Bill Kauffman's mantra during Friday's ribbon cutting ceremony for the Blue Water Convention Center. "The most important thing is that it came in on budget," he said in front of hundreds of eager listeners. "Getting this project done is big weight off our minds. There is still some work that needs to be done, but for now we can celebrate." With an international crossing and passing freighters outside, politicians and county employees spoke about the process that brought the center to where it's at today. John Wheeler, president of Orion Real Estate Solutions and developer of the DoubleTree by Hilton Port Huron and the convention center, said the final version of the $9 million facility exceeded his expectations. Wheeler said he chose Port Huron and St. Clair County because he noticed how much officials worked together on attracting projects. Now he can't wait for what comes next. "It's a culmination of a lot of energy, a lot of partnerships and a lot of expectations turned into reality," he said. "This place has got some magic going on. The work continues, but in a very different format." Large items — including a pitched tent, bounce house and trolley — where stationed in the back of the room for comparison to the height of the ceiling. "We were just sitting around thinking about what we could do that might demonstrate the immensity of the facility," Kauffman said. "We had heard of another SMG site where they actually brought in a Ferris wheel to demonstrate the size. We brainstormed and came up with this." Kauffman said when the center opens for events, the Blue Water Trolley will be bringing people to the downtown area and back to their hotels. County board chairman Jeff Bohm reminded audience members about how the county first identified a need for a convention center in 2010. "It wasn't about how much business we could bring to the area, it was about how much business we were losing in the area," he said. 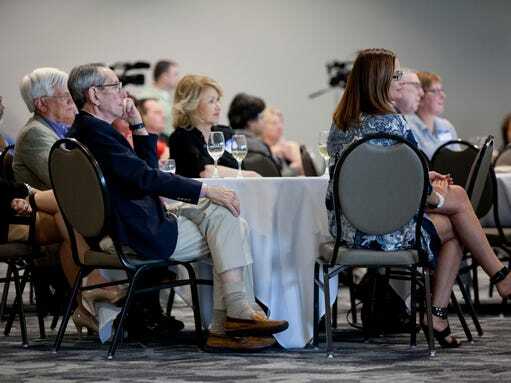 Legislators including Sen. Debbie Stabenow, Sen. Phil Pavlov, Rep. Paul Muxlow and Congresswoman Candice Miller made appearances and spoke at the two-hour event. Having been involved with the project for the last few years, county commissioners and Port Huron City Council members were in attendance as well. 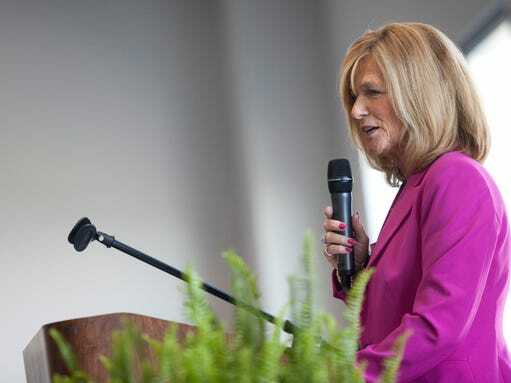 Mayor Pauline Repp called the completion of the convention center "the last piece of the puzzle." The 40,000-square-foot facility is the final piece of the private-public redevelopment along the waterfront announced four years ago. Already completed is the renovation of the former Thomas Edison Inn into the DoubleTree, Freighter Eatery and Taproom and the addition of the Culinary Institute of Baker College south of the hotel. "A lot of people were skeptical that this amazing development would actually take place," Repp said. "Certainly many people were not convinced that this was the best use of taxpayer money. I believe this will be a catalyst for job creation and bring thousands of visitors to the Blue Water Area." Construction of the convention center was paid for by the county, city of Port Huron and Blue Water Area Convention and Visitor's Bureau. The convention center so far has three events booked for May, including a 1,700-person convention and two wedding receptions. SMG, the company that manages the center, said several other events are pending. Saturday will include an open house from 11 a.m. to 2 p.m. for the public to come and take a self-guided tour. 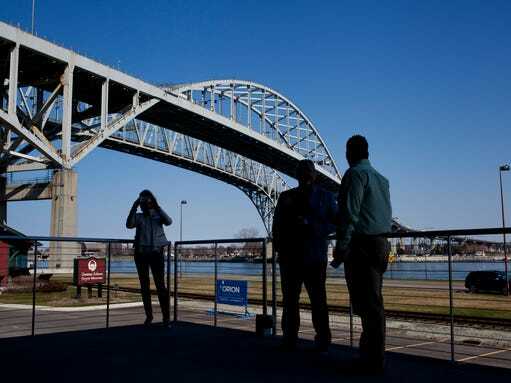 •The county will hold the convention center's open house from 11 a.m. to 2 p.m., Saturday at 500 Thomas Edison Parkway in Port Huron. •Plans for the Blue Water Convention Center were announced in October 2011. •The Baker College facility opened to students in July 2013. The DoubleTree by Hilton and Freighters Taproom and Eatery opened in August 2013. •December 2013 St. Clair County put out a request for construction bids for the convention center. •Groundbreaking construction of the convention center began in May 2014. •Through March 31, about $8.7 million in land acquisition, construction and soft costs has been spent on the $9 million facility.